What do you think of when you think about being philanthropic? A gala for celebrities to donate millions to a charity? A food and clothing drive after a natural disaster? Dropping some coin in a donation box around a holiday? In our popular imagination, being philanthropic can often be perceived as needing vast amounts of money to donate or donating only during some horrific event or just when holidays approach. Philanthropy can be more than just these things. And no, you don’t have to be wealthy to be a philanthropist. You also don’t have to wait until a certain time to give. As giving culture becomes more popular globally, people are learning that giving back can be incorporated into the everyday and can be done in simple, yet impactful, ways. So how can we move from thinking of philanthropy as an elite practice or something that happens irregularly? It’s important to understand that philanthropy is happening all the time, even if people don’t conceptualize it as such. Giving time, resources, or skills to help causes occur frequently in everyday life. This, in fact, is what philanthropy is. Why are these sorts of common activities not considered really philanthropy by many people? Is it because it isn’t on a large scale? Or, are they not recognized because it seems too easy? A recent instance of philanthropy made the Facebook rounds in Serbia that highlights what people can do to give in various ways: As a police officer was issuing parking tickets for cars that either didn’t have a permit for the location or those who were over the time limit, someone paid for another driver’s parking ticket and left a note asking them to do the same for someone else. Paying for a parking ticket is something that can be a taxing expense and can be a burden for those already struggling financially, of course. But we can still replicate the gesture. If you can do something like pay someone’s ticket, awesome. Go for it! But there are other ways to help as well. For example, if you have the money, you can pay for a person’s coffee at a café you are visiting. Or, purchase a meal for a person in need. I had a friend who always kept granola bars in her bag, in case she ran into someone who needed food. If she didn’t have money to give them to buy something, she at least would have the granola bar for them. It was a simple philanthropic practice. I witnessed another example a few weeks ago. While at a friend’s flat having coffee and chatting, her buzzer rang. She went to answer and when she came back to the kitchen table she told me that it was a young boy from a family in the neighborhood that she helps financially. She had promised to buy him some new shoes that day, so he came to ask when she would be free to go to the shop. I also found out that she had been teaching him English. Her philanthropic giving wasn’t just financial support or buying the young boy shoes, she was also helping him learn another language, an extremely useful skill. And if you don’t have the finances to contribute like the people mentioned above, there are other ways. In conversations with other team members here at Catalyst Balkans, one person highlighted that she finds sharing skills to be a useful philanthropic action that people can do often. Another told me about a project around the region called Hooks of Kindness where people can leave in-kind donations of food or clothing for people in need to pick up. These are all easy actions that can help someone. Philanthropy doesn’t have to be complicated or done sparingly. A simple action can make a huge difference for someone, and that is why we do philanthropy: to improve lives and to make a positive impact. In the Balkans, there are plenty of ways to give in significant ways. 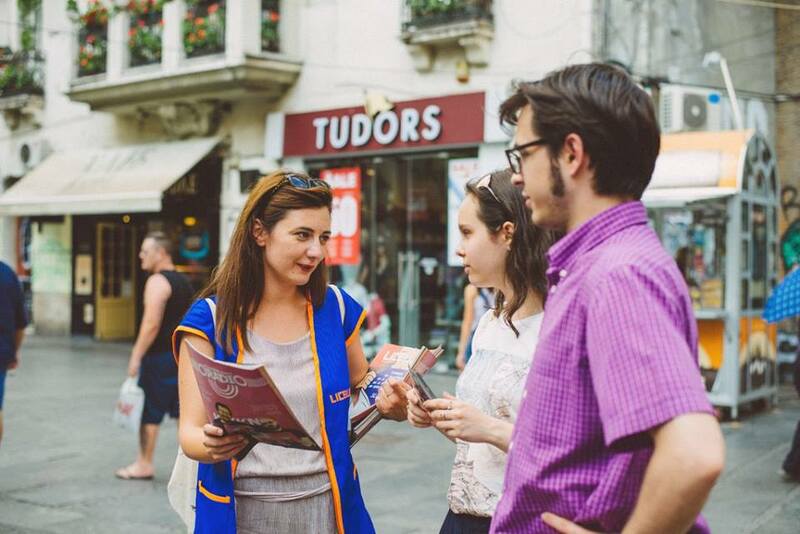 If you’re in Belgrade, you can easily purchase a Liceuclicemagazine. Every vendor, who is either unemployed or cannot work, receives 50% of the profit from selling the magazine. In Zagreb, you can join the Facebook page FB Humanitarci Zagreb, which provides a platform that individuals and families in need can ask for support. And there are other Facebook pages that can help you be philanthropic! Cipele46, for example, uses the group to also support individuals in need. Inspired by a note posted at bus station from a person needing shoes, the group allows people to write the information of people in need and also serves to allow people to post when they have an abundance of needed items that they would like to donate. Again, a very simple way to be of help to someone in need. Across the region, there are also other simple ways to give including Hooks of Kindness where you can leave canned goods for those without food. Now that we’ve highlighted some everyday philanthropic instances, do you have a story to share or thoughts on the making philanthropy an everyday practice? Feel free to leave a comment and continue the discussion!